SISTANT mats are designed for limited exposure to oils, while GREASE PROOF mats are the best choice for durability when exposure to grease and oil is heaviest. Any mat not properly maintained or used improperfy will not yield the service life desired. authorized by factory for return and shipped freight prepaid for inspection and evaluation. PLEASE CONSULT WITH FACOTORY FOR SPECIFIC INFORMATION PRIOR TO MAKING PURCHASE. Wash boards using all-purpose detergent and warm water. then wipe with sanitizer diluted with water. 1s· x 24 • on edge. Allow a minimum of 1 • space between heated surface and board. ½" thick boards - support every 6", ¼" boards every 12·, and 1 • boards every 18". Grease Resistant or Grease Proof matting subjected to grease and oil must be cleaned, both sides, on a regular basis (daily for busy commercial use), with warm water. a deck brush, and a mild detergent absent of bleach, chlorine or butyl. For maximum performance, mats should be cleaned daily using a mild detergent. warm water and a deck brush to remove all grease. Mats not cared for properly (grease cleaned off daily), or use of mats not designed for greasy areas, may not provide the service you require and will not be covered by any warranty. 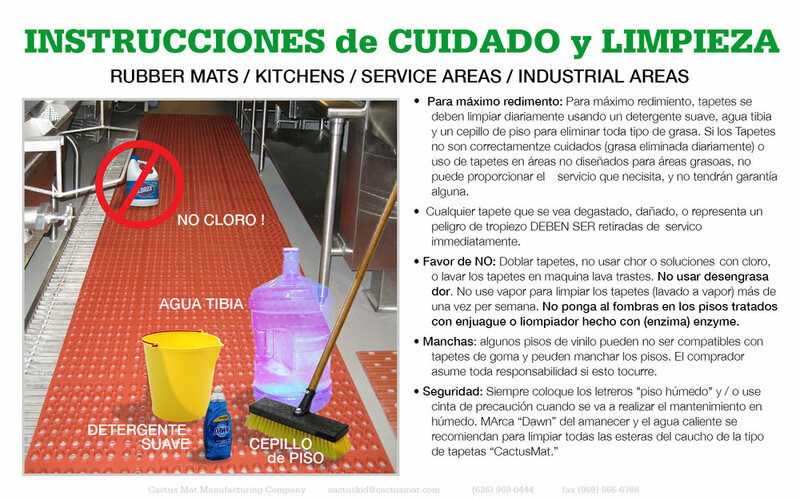 Any mat that is worn, damaged, or presents a tripping hazard should be removed from service immediately. DO NOT: Fold Mats, use bleach or chlorine solutions, or wash in dishwasher. Do not use a degreaser. Do not steam clean (power wash) more than once per week. Do not place mats on floors treated with no rinse enzyme cleaner. STAINING: Some vinyl floors may not be compatible with rubber mats and staining may occur. Buyer assumes responsibility should staining result. Note: The above are general guidelines. Some of our products come with specific care and maintenance instructions which should be followed for maximum product life and service. 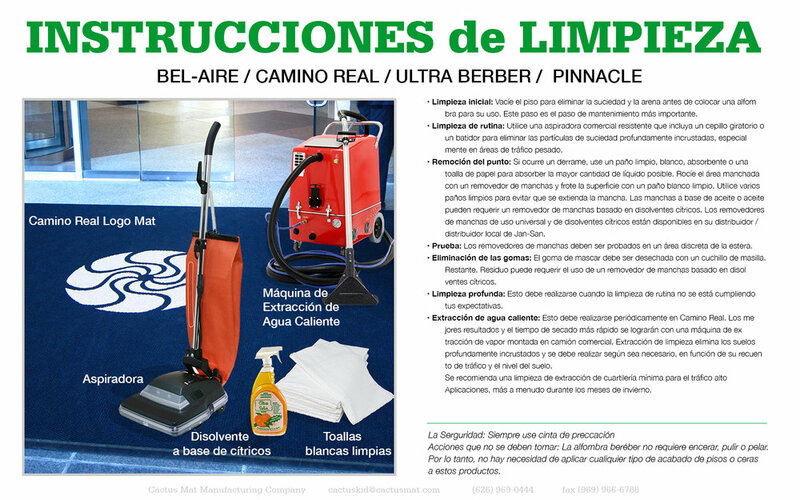 FULL LINE CATALOG: May now be viewed via 1) Hard Copy, 2) On line at www.cactusmat.com INDIVIDUAL SALES SHEETS: Available on key products and may be imprinted for promotional purposes. Complete line or customized for your specific marketing project. CLICK HERE to view or Kitchen Mat Cleaning Video or visit the SELLING TOOLS portion of this website.